"Command Performance with Dinah Shore and Chico Marx"
Born Leonard Marx, Chico Marx was the oldest of the Marx Brothers. His nickname was orginally pronoucing "Chick-oh" not "Cheek-oh" because he was a "chicken chaser" as in he liked the ladies. Chico Marx developed his well known crafty con artist persona with a bad Italian accent early in childhood mimicking boys in the neighborhood. As a boy, being the eldest he was given piano lessons and became quite proficient playing the piano and would get so many gigs that his younger brother and lookalike Harpo would fill in. Chico Marx was known for his keyboard flamboyance on the piano often "shooting" the keys off the piano. In some of the Marx Brother's films he can been seen playing the piano with his fists and elbows. 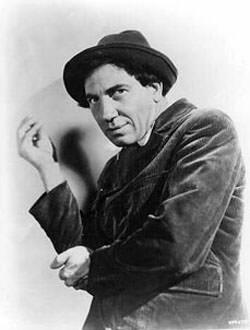 When the Marx Brother's mother and manager Minnie Marx died, Chico Marx became the manager of the group. His connections to the film industry allowed the brother to further their careers and profit more from each movie made making 15% of total gross. 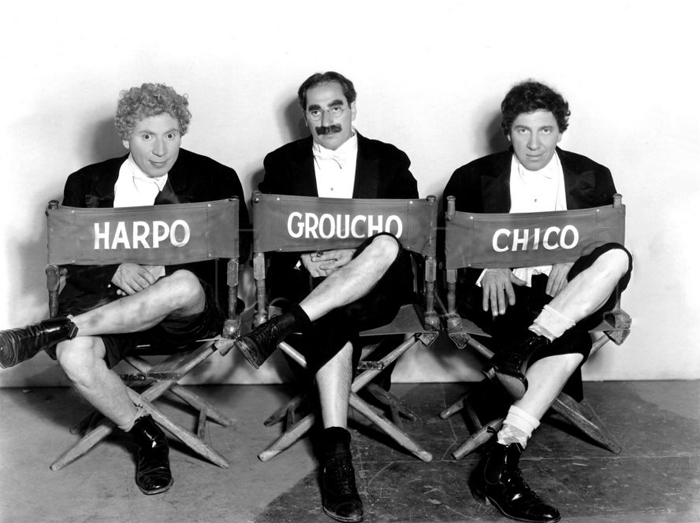 It was under his guidance and hustling charms that the Marx Brother became stars in Hollywood. He was a compulsive womanizer and gambler and kept his career going long after his brothers retired. They came together again for his benefit to make "A Night in Casablanca" in 1946 to help him earn money again. The brothers finally took his money and gave him an allowance to help curb his spending and gambling. See also: Groucho Marx Collection and Harpo Marx Collection. Be the first to comment on "Chico Marx"